The idea of ​​creating baubles has its roots in North America. We have come up with these wonderful ornaments in the form of bracelets Indians, that creating Fenichka, We gave it a special meaning and gives her the strength mascot friendship. In consequence of all the traditions associated with braided bracelets friendship and love hippies took over and brought in their own corrections. Currently Baubles become quite common decoration, which can even be purchased in stores. 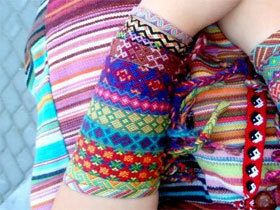 But still weave a bracelet for myself for many remains much more interesting occupation, you buy it off the shelf. Since in this case it can be done individually for themselves according to their tastes and preferences, In addition such a product can be a great little presents, so how to get little things, hand made always pleasant. 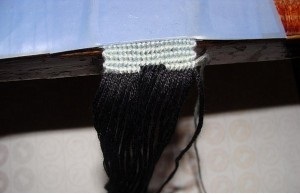 Fenichka weave by using different materials, but one of the most common are the thread floss. Do it yourself, even for beginners not so difficult, most importantly choose the most suitable and easier way. 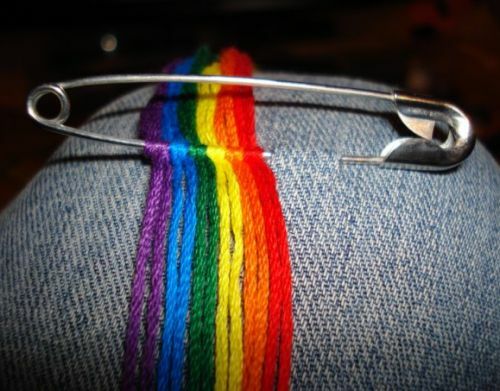 Sewing thread of different colors (thread length for future articles are always taken into 4 times higher, than the very future of decoration). pin, Scotch, clamp or tablet as anchorages yarns. 1 way of. Each individually taken yarn bundle is fastened at one end to the pin. But she had a pin is assigned to the cloth or chair, eg. 2 way of. The yarns are fixed by means of plate - clip special plates with. 3 way of. 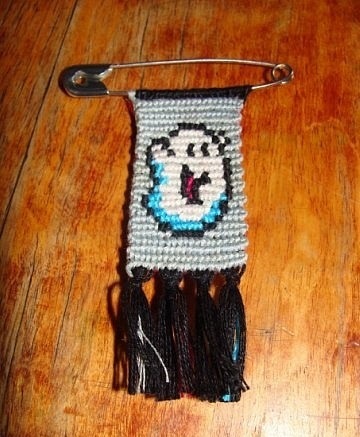 taken clamp for this method, and between him and a book or thick notebook puts the thread floss. Then the clamp is fixed. 4 way of. prepared thread, bunched, ends are fixed to any surface, in which it will be convenient to work, using a wide adhesive tape. In each of the methods is necessary yarn advance properly distributed in color according to the selected weave pattern of floss fenechki. 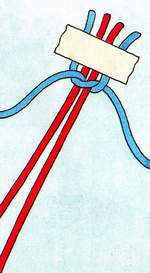 The main knot. This node has its name because, that it is based on all weaving baubles. It is performed using two yarns, in the following way. One of the strands, in this case yellow, slips beneath another, so to get a loop, in which this same yellow thread is passed. After the loop is pulled to the ground and tightly woven delayed. Very important, all nodules obtained the same size. half knot. This node is already with four threads. 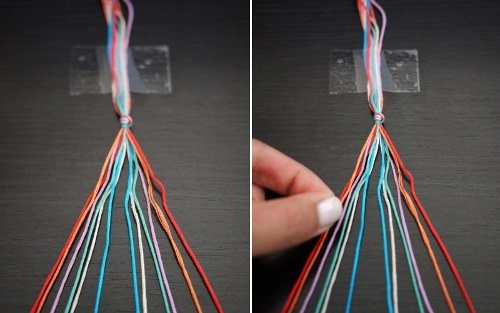 For its binding the two middle strands need to tighten and secure, eg, with adhesive tape. 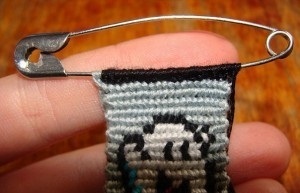 Then thread, located on the left side, moves on top of and secured to hook under the right thread. 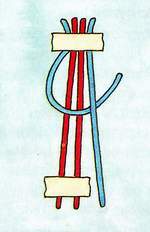 Then the far right strand is passed under a fixed, the bottom is passed through the loop, formed at the left-hand thread, and both threads are tightened to form loops. flat knot. This knot is very simple, for this extreme left thread jumped on average, and the extreme right odevaetsya bottom in a loop. Then the extreme right-the thread needs to throw on the middle and pry under the left, and the leftmost skip through the middle and throw to the right. Then the ends are extended to give nodule. 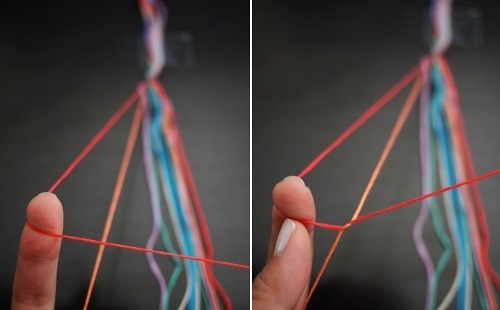 You were shown the most simple components and instructions to them, learning how to do that every beginner will be able to weave Baubles of floss with a simple pattern, and then begin to learn to do something more complicated, selecting one of the favorite ways. 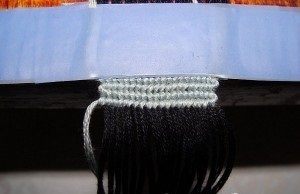 The most common and popular braiding techniques are direct and oblique weave. With direct weave are made more complex patterns, forming various patterns, and the method of oblique weaving baubles of floss is well suited for beginners and only an exciting experience, so the first thing we consider is his. 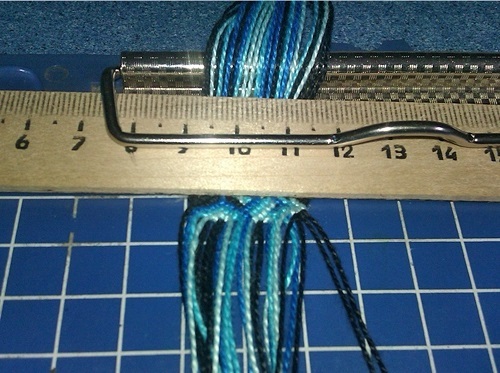 Make a knot fastening, at about 10 cm from the beginning of the product. Take the left edge of the two lines. The first thread is worn on the index finger, slightly pulling it, and the other adheres to the thumb and middle finger, resulting figure should get, similar to the figure four. 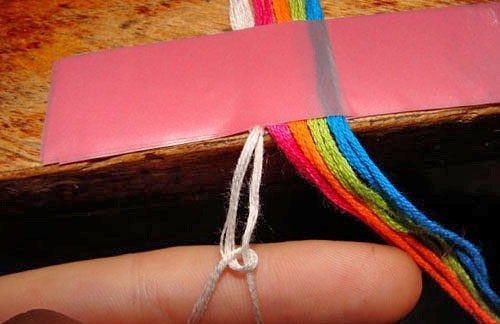 Palmed off under extreme thread and a second elongated from top to bottom is passed through the formed shape and contractible thread, gently forming the first knot. 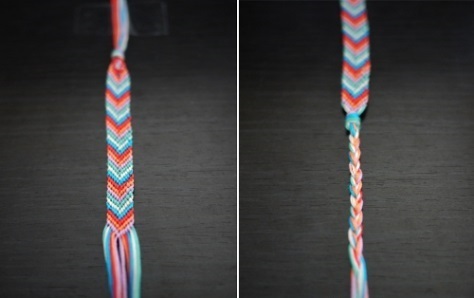 Then, on the same threads is similar to the second knot. In the next step we take two threads from the right edge, and just as the left hand weave two nodules. Then we take from the left edge of second and third strands and propletaem same nodules, The same is done with the right hand. The action is repeated towards the middle, until all the threads mutually propletutsya with each other and the thread does not initially a former extreme would mean. The second and subsequent rows propletayutsya similar to the first. At the end of weaving is done fixing knot. As a result, it turns out Fenichka weave with a pattern very similar to the multi-colored Christmas tree. 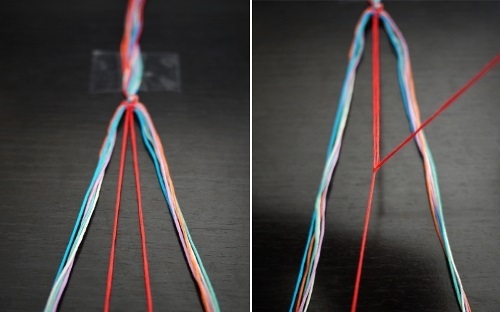 When weaving fenechki direct way of floss operating beam filaments as it is divided into two groups, on the plain thread, It is the basis for fenechki and multicolored background pattern and, wherein the thread length is increased for a picture depending on how he will be close. The essence of weaving products in this way is, that the pattern thread twist yarn base according to the scheme. 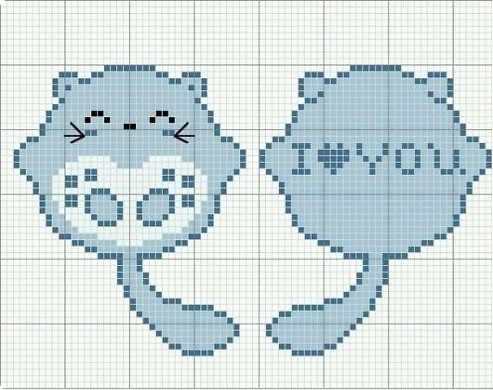 nor, fenechki chosen for the creation of a direct braided floss attached in the following sequence, first ones, that will bind base, ie drawing vyvyazyvayut, and after the main thread and the background, i.e, those with which the pattern begins. We consider in detail the process of manufacturing a direct weave fenechki the following example. 1. To take a picture thread of five colors: gray for the background and black, red, white and blue for the image itself. The length of the filaments for drawing should be about 100-110 cm. 2. 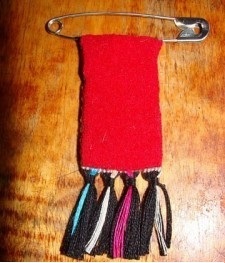 Attach the first thread, which will be used not primarily, namely white, red and blue. then those, with whom, and will start items: basic black and gray. 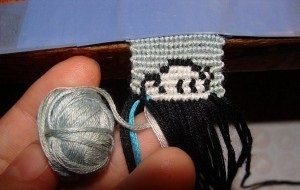 And gray thread should be longer than all, since netting pattern will be used more often. 3. Wickerwork begin to gray thread. 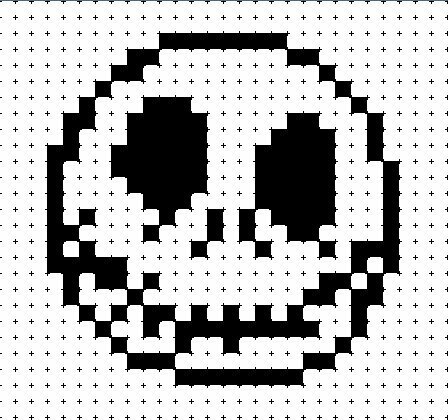 To do this, take the thread of that color and at first it throws over the left at a black thread, and then we start it at her, and again on a thread base, bringing it under its same beginning. After these manipulations is formed in a loop that is passed from top to bottom and gray thread, then gently tightens it to the top of weaving and tighten the resulting knot. Thereafter a nodule at the same yarn repeat a second time. In the same way the gray thread interwoven and all 19 black threads of the base, and then following 4 a number. 4. Then nodules selected color scheme. According to a first gray binded filament 8 black thread(two knots), then do 5 black knots. For this black thread binded gray, making two nodules in the same manner, as in paragraph three, and given, that must remain fixed gray thread. Then again, do a drawing to the end of a number of gray nodules. 5. In the next row under the black nodules provyazyvayutsya black, under gray gray. 6. In the sixth row of the weave is turned white. Entering a new color is as follows: gray thread is laid for weaving, but instead takes the white and work continues on the scheme, ie black threads will entwine already white thread. 7. 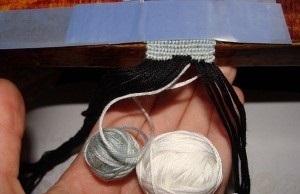 Once the required number of knots white floss was done and propleteny on the thread of the same two squares of black color, can be recycled gray thread, dopletaya drawing to the end. 8. 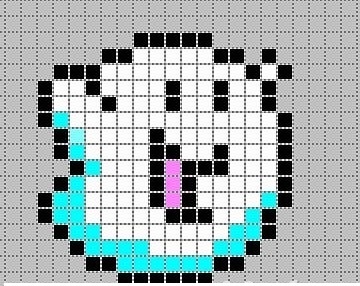 Weave continue under the scheme until, until we reach the entry thread of blue. 9. Thread derive similar white, replacing the white on blue and carrying a bundle with the new color. And then again on the weave pattern diagram. 10. 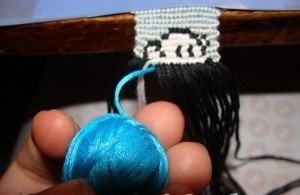 In order for the blue thread quietly left the weave, it is necessary to withdraw gradually. To this end, as is the case with white thread braided with two black squares and only then return the main thread background, ie gray. Then again we continue to weave in pattern. 11. Red thread is also entered as the previous drawing new colors, after which, together with her dopletaetsya rest of the image. To figure turned, it is important to carefully weave bundles a single step without departing from the scheme. 12. 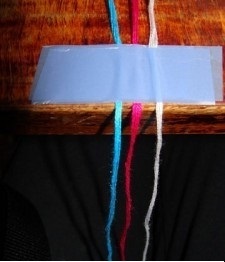 After weaving was brought to an end, remaining thread ends connects, so that in the end will receive four trim and the same node. 13. 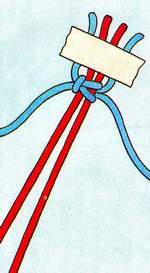 Upper thread white, blue, red and gray colors anchoring knots and cut off, and black thread anchoring knots via pins. 14. In order to hide the error from the wrong side, cut the desired size rectangle of thin fabric and carefully sew it with baubles. Prepare 8 threads for letters, eg, blue for the main background 5 nitochek, and one of them is a little bit longer. 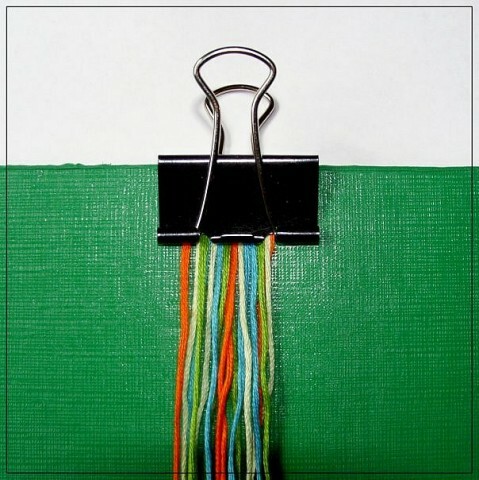 Spread strands as follows: Long green or main, two short green, 8 blue and 2 green, then gently, to avoid mixed color, We connect them together. The first row is knotted, leftward. 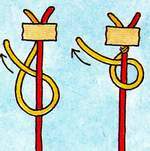 Are made as follows:: main thread throws on top of one of the strands in the direction from right to left, is passed under it and over his command, then this action is repeated again and the knot is tightened. The second row is also performed the main thread, only nodules, the right direction. For this vyvyazyvayut nodes, as in the first row, Only the thread snapped from left to right. In the third row begins vyrisovyvanie letters. To this end, the main thread runs from top to bottom two nodules, looking to the left side, and then 7 right node, and the rest left again. fourth row. Down up: 5 nodules right, 1 to the left, Three nodule right, 1 to the left, 2 to the right. fifth row. Top down: Two nodules left,1 to the right,3 to the left, 1 to the right,5 to the left. sixth row. Down up: Two to the right node,7 to the left,3 to the right. After this series provyazyvaniya letter ready. is a short distance to all of the letters in the word did not merge between them 2-3 ryadochka loops. Weave fenichek of floss albeit a bit time-consuming, but still an exciting experience. 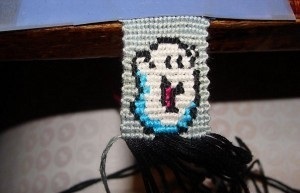 Having trained and filled his hand with this type of needlework can do for themselves, and for their loved ones many beautiful bracelets, who will always be pleasing to the eye.